Worried about your valuables while moving? Here are some helpful tips from our Calgary movers on how to keep your heirlooms and other precious items safe during your relocation. Now that you have your relocation date set and you know where you’re moving to, getting from one place to another can feel a little overwhelming! With so many things to do, it’s important to ensure you organise it all well. Over the years, you will collect many items that are valuable to you, and it’s natural to worry about them becoming damaged or lost during a relocation.The good news? With some forward planning, professional help, and careful organisation, you can ensure that all your precious items arrive at your new destination safely and in one piece. Most families have fun collectable items that they have gathered over the years. It may be something inexpensive and portable like coffee mugs, or could be something more fragile and expensive such as framed artwork. For small, fragile items, use layers of packing paper, bubble wrap, and small cardboard boxes to keep them secure. REMEMBER: make sure they can’t move around in the box. Wrap your framed artwork in towels, packing paper, or light blankets and then place them upright in large cardboard boxes. Art absorbs most pressure when resting on its frame, so DON’T lay the box flat. Large speciality items should be wrapped in layers of packing paper, followed by a blanket. If they have handles or spouts, use bubble wrap and pieces of folded cardboard, and secure everything with packing tape. Carrying around albums full of wedding photos, baby pictures, and other special memories can become heavy and take up a lot of space. It also increases the risk that photos will be spoiled or get damaged by water. Create digital photo books with multiple photos printed on each page, so the photobooks will take up less space and last longer. Backup all your photos on a hard drive as this is easier to carry from place to place. You can even use a virtual storage location like the cloud. This way, your memories will never get lost or damaged. 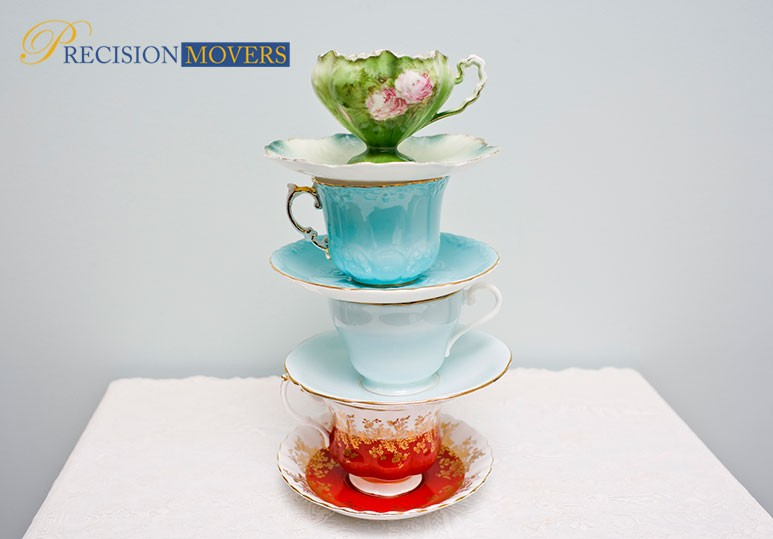 If you have china dishes, fancy glassware, porcelain figurines, or anything else fragile, you may be worried because such items are notorious for breaking or getting lost during a move. While your best bet would be to hire professional movers, you can also try the following. Use professional moving supplies such as dish pack containers and corrugated separators to protect any dishes or glassware. Use bubble-wrap around each piece of crystal or glassware. Pack them in an upright position. Fill the bottom of each box with wadded packing paper or Styrofoam to reduce the impact of transport. Christmas ornaments are very valuable keepsakes because they often hold a lifetime of family memories. There are a number of different ways to protect these items. Consider a specially made wreath storage bin for expensive, handmade wreaths. For an expensive, artificial Christmas tree, invest in a sturdy-sided storage bag or container (NOT cardboard) to reduce the risk of damage to branches and lights. Precision Movers has been successfully relocating Calgary residents across Western Canada for over three decades, and we’re dedicated to providing our clients with seamless, affordable, and efficient moving services. Whether you’re moving into your dream home, or a brand new office, our professional team of Calgary movers have the equipment and know-how to get you and your belongings safely and quickly into your new space. To find out more about how our professional Calgary movers can help you relocate your heirlooms and fragile items safely from one home to another, contact our office at 403-540-4393 or fill in our online contact form.